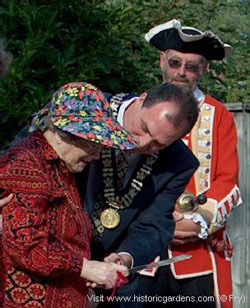 The Annapolis Royal Historic Gardens Society is a charitable organization (Charitable Number 106714736 RR0001) dedicated to the preservation and development of the Historic Gardens as a world class attraction. There are many ways you can support us in our mission, from membership and volunteering, to considering a donation to the Gardens! Memorial Donations: You may wish to honour the life of a loved one through a gift to the Gardens. Your donation will be recorded in our Donation Register, and a notice will be sent to the person's family, according to your instructions, indicating that a donation has been made in support of these beautiful gardens. Celebration Gifts: These gifts are limited only by your imagination: they can celebrate accomplishments, mark special occasions, or salute a great friendship. Again, the donation will be recorded in our Register, and you will be provided with a special card which you can send to the person being recognized, letting them know about this unique gift in their honour. Donor Tree: The Historic Gardens Donor Tree provides an opportunity for donors to recognize special people or occasions in a unique and lasting way. Our Donor Tree is a metal garden sculpture, approximately ten feet tall, created by artist Scott Hamlin. For a donation of $250, you may dedicate a leaf in memory of a loved one, to honour an occasion, or simply to support these wonderful Gardens. 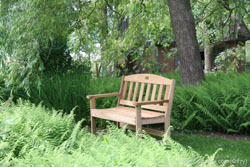 Bench Sponsorship: Another way to make a visible and lasting gift to the Gardens is with a Bench Sponsorship, in memory of an individual, to commemorate an event, or simply to reflect your own love of the Gardens. (Availability is limited - please inquire). Planned Giving: Make a longer term commitment to support the Historic Gardens. As you consider your role in the future of the Historic Gardens, you may want to explore some ways you can provide financial support in the years ahead. "We have here a rare treasure...and consequently a compelling responsibility to ensure that its second quarter century will be the equal of its first"